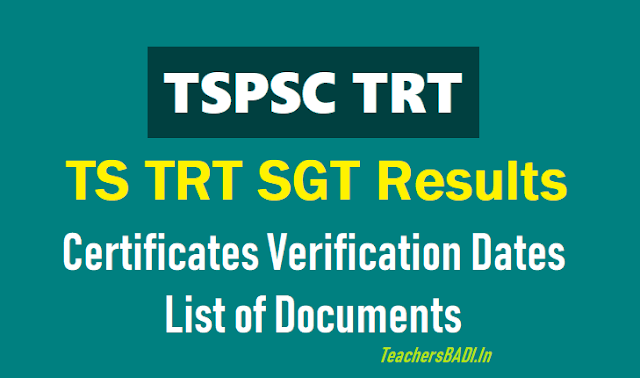 TSPSC TRT SGT Selection List Results for Certificates verification. TSPSC TRT SGT Merit List Results for Verification of Certificates. TS TRT SGT list of selected candidates will be announced soon and The subject Wise, date wise schedule of SGT Certificates verification will be intimated shortly on TSPSC Web portal. Telangana State Public Service Commission has released the list of candidates who have qualified in the Teacher Recruitment Test (TRT) for the post of Secondary Grade Teacher (SGT) Telugu medium on its official website on April 4, 2019. TSPSC has released the results for Physically Disabled (VH/HH/OH) candidates. Candidates are advised to visit the official website of TSPSC- tspsc.gov.in- to obtain the result. TSPSC will conduct Certificate verification (3rd spell) at Telangana State Public Service Commission, Prathibha Bhavan, MJ Road, Nampally, Hyderabad. The notification further reads “Certificate verification (3rd spell) is scheduled to be held at Telangana State Public Service Commission, Prathibha Bhavan, MJ Road, Nampally, Hyderabad and date will be informed in due course.” Candidates are advised to visit the official website of TSPSC regularly to get the latest update on date. Certificate verification (3rd spell) scheduled to be held at Telangana State Public Service Commission, Prathibha Bhavan, MJ Road, Nampally, Hyderabad and date will be informed in due course. Please visit the Commission’s website www.tspsc.gov.in for the verification material and further details. TSPSC has informed that, on the basis of OMR Examinations held on 25/02/2018 FN to the Post of SECONDARY GRADE TEACHER-TELUGU notified vide Notification No.53/2017 for a total no. of 3786 vacancies in School Education Department the 85 HH/VH candidates were provisionally short listed for 2nd spell of Certificate Verification. Certificate verification (2ndspell) is scheduled to be held on 30/03/2019 from 10:30 AM onwards at Telangana State Public Service Commission, Prathibha Bhavan, MJ Road, Nampally, Hyderabad. In continuation to Result Notification dated: 18/07/2018 to the post of Secondary Grade Teacher-(TELUGU) the following 85 HH/VH candidates were provisionally shorted listed for certificate verification on the basis of OMR/CBRT Examinations held from 24/02/2018 to 04/03/2018 FN&AN notified vide Notification No. 53/2017 for a total no. of 3786 vacancies in School Education Department. The candidates with the following Hall Ticket Numbers are provisionally shortlisted for 2nd spell for want of eligible candidates in Communities/categories/District. The candidates who were called for Verification of Certificates have to produce the following certificates in original along with a set of Photostat copies duly attested by Gazetted Officer at the time of Verification of Certificates, failing which, they will not be admitted in subsequent process of selection. No request will be entertained for subsequent submission of any of the required certificates. In terms of the Notification, the candidate should possess the requisite qualifications as on the date of the Notification. The Commission reserves right to disqualify any candidate, if she is not found eligible for any reason at any stage. Admission to Certificates Verification does not confer ipso facto any right for Final selection. Certificate verification (2ndspell) scheduled to be held on 30/03/2019 from 10:30 AM onwards at Telangana State Public Service Commission, Prathibha Bhavan, MJ Road,Nampally, Hyderabad. The TSPSC is making all he efforts to complete Medical Board verification for PH candidates by the end of March, so that results for Secondary Grade Teacher (Telugu Medium), vide notification no.53/2017 can be released during the 1st week of April 2019. In continuation to Result Notification dated:18/07/2018 to the post of Secondary Grade Teacher - (URDU MEDIUM) the following 35 candidates were provisionally shorted listed for certificate verification on the basis of OMR/CBRT Examinations held from 24/02/2018 to 04/03/2018 FN & AN notified vide Notification No. 53/2017 for a total no. of 636 vacancies in School Education Department. The candidates with the following Hall Ticket Numbers are provisionally shortlisted for 2nd spell for want of eligible candidates in Communities/categories/ District. The candidates who were called for Verification of Certificates have to produce the following certificates in original along with a set of Photostat copies duly attested by Gazetted Officer at the time of Verification of Certificates, failing which, they will not be admitted in subsequent process of selection. No request will be entertained for subsequent submission of any of the required certificates. In terms of the Notification, the candidate should possess the requisite qualifications as on the date of the Notification. The Commission reserves right to disqualify any candidate, if she is not found eligible for any reason at any stage. Admission to Certificates Verification does not confer ipso facto any right for Final selection. Certificate verification (2nd spell) scheduled to be held on 03/01/2019 from 02 PM onwards at Telangana State Public Service Commission, Prathibha Bhavan, MJ Road, Nampally, Hyderabad. On the basis of OMR/CBRT Examinations held from 24/02/2018 to 04/03/2018 FN & AN to the Post of SGT SECONDARY GRADE TEACHER-ENGLISH MEDIUM notified vide Notification No.53/2017 for a total of 909 vacancies in School Education Department, the 142 candidates were provisionally short listed for 2nd spell of Certificate Verification. Certificate verification (2nd spell) is scheduled to be held on 13/12/2018 from 10:00 AM onwards at Telangana State Public Service Commission, Prathibha Bhavan, MJ Road, Nampally, Hyderabad. In continuation to Result Notification Dated: 18/07/2018 to the post of SGT SECONDARY GRADE TEACHER ENGLISH MEDIUM the following 142 candidates were provisionally short listed for certificate verification on the basis of OMR/CBRT Examinations held from 24/02/2018 to 04/03/2018 FN & AN notified vide Notification No. 53/2017 for a total no. of 909 vacancies in School Education Department. The candidates with the following Hall Ticket Numbers are provisionally short listed for 2nd spell for want of eligible candidates in Communities/categories/ District. The candidates who were called for Verification of Certificates have to produce the following certificates in original along with a set of Photostat copies duly attested by Gazetted Officer at the time of Verification of Certificates, failing which, they will not be admitted in subsequent process of selection. No request will be entertained for subsequent submission of any of the required certificates. In terms of the Notification, the candidate should possess the requisite qualifications as on the date of the Notification. The Commission reserves right to disqualify any candidate, if he/she is not found eligible for any reason at any stage. Admission to Certificates Verification does not confer ipso facto any right for Final selection. Certificate verification (2nd spell) scheduled to be held on 13/12/2018 from 10.00 AM onwards at Telangana State Public Service Commission, Prathibha Bhavan, MJ Road, Nampally, Hyderabad. For results Notification and verification material details visit Commission’s website (www.tspsc.gov.in). SGT Certificate Verification: In continuation to the list of candidates short listed for certificate verification on the basis of OMR/CBRT Examinations held from 24/02/2018 to 04/03/2018 FN&AN to the Post of Secondary Grade Teacher [Telugu, English Medium] notified vide notification No.53/2017 published on 18.07.2018 and 21/07/2018. 33 candidates are provisionally short listed for Certificate Verification in 1:3 ratio Certificate verification will be held at the 10 erstwhile District Headquarters. The Candidates are instructed to attend Certificate verification at their Local District Headquarter (DEO Office). Mentioned against their Hall Ticket numbers. For list of candidates and verification material please visit Commission’s website (www.tspsc.gov.in). In continuation to shortlists for certificate verification dt: 18/07/2018 and 21/07/2018 to the post of Secondary Grade Teacher (Telugu, English Mediums) the following 33 candidates are provisionally shortlisted based on merit for certificate verification incompliance with the orders of Hon’ble High Court. Note: The Pickup of candidates who approached Hon’ble High Court and obtained interim orders to allow them for further process is purely provisional and subject to outcome of respective W. P’s/ W.A.s. Pending before the Hon’ble High Court. Certificate verification will be held at the 10 erstwhile District Headquarters. For convenience of the candidates the certificate verification will be conducted at their native districts. The candidates are instructed to attend their Local District (Mentioned against Hall Ticket number) Head Quarters (DEO office) for Certificate Verification on 27/08/2018. Candidates are instructed to give the District preferences through Commission’s Website before going to certificate verification. 1. TSPSC TRT SGT Memo to candidates for certificate verification. About 13,666 candidates who have been picked up for the certificate verification for the post of secondary grade teacher (all mediums) will have to attend verification at respective erstwhile 10 district headquarters from August 13. The Telangana State Public Service Commission in a press statement on Friday said hall ticket numbers for subject wise and date wise schedule of verification has been placed on the website http://www.tspsc.gov.in. The PSC asked candidates to exercise their preference of posts from August 11. It said selection of candidates will be based on the preference of posts/zones/districts for which options were given by the candidates. The candidates who have been picked up for certificate verification dated 18/07/2018 & 21/07/2018 for the post of Secondary Grade Teacher (All Mediums) vide notification no.53/2017 dated 21/10/2017 have to produce the following certificates in original along with a set of Photostat copies duly attested by Gazetted Officer at the time of Verification of Certificates, failing which, they will not be admitted in subsequent process of selection. No request will be entertained for subsequent submission of any of the required certificates. In terms of the Notification, the candidate should possess the requisite qualifications as on the date of the Notification. The Commission reserves right to disqualify any candidate, if he/she is not found eligible for any reason at any stage. Admission to Certificates Verification does not confer ipso facto any right for Final selection. The qualified candidates for the post of Secondary Grade Teacher vide Notification No. 53/2017 (General Recruitment) in School Education Department. Written Examination held from 24/02/2018 to 04/03/2018.are hereby directed to attend for verification of certificates from 13-08-2018 onwards at erstwhile 10 District Head quarters as per schedule. The candidates who were called for Verification of Certificates have to produce the following certificates in original along with a set of Photostat copies duly attested by Gazetted Officer at the time of Verification of Certificates, failing which, they will not be admitted in subsequent process of selection. No request will be entertained for subsequent submission of any of the required certificates. In terms of the Notification, the candidate should possess the requisite qualifications as on the date of the Notification. The Commission reserves right to disqualify any candidate, if she is not found eligible for any reason at any stage. Admission to Certificates Verification does not confer ipso facto any right for Final selection. Note: The short listing of candidates who approached Hon’ble High Court and obtained interim orders to allow them for further process is purely provisional and subject to outcome of respective W.Ps/W.A.s. Pending before the Hon’ble High Court. TSPSC TRT School Education Department - Notifcation No. 53/2017 Dt . 21/10/2017:: Secondary Grade Teacher Candidates Short Listed for Certificates Verification. On the basis of OMR/CBRT Examinations held from 24/02/2018 to 04/03/2018FN&AN to the Post of Secondary Grade Teacher [Telugu, English, Bengali, Hindi, Kannada, Marathi, Urdu & Tamil Mediums]notified vide notification No.53/2017 for a total no. of 5415 vacancies in School Education Department the candidates with the following Hall Ticket Numbers are provisionally short listed for Certificate Verification in 1:3 ratio, 13665 candidates are short listed on the basis of Merit and reservations. The Commission has examined the interim orders of Hon’ble High Court in W.P No.5017 of 2018 where in it was directed “not to publish result of Khammam and Warangal Districts”.The present short list of candidates is meant for verification of certificates and it is subject to final orders of Hon’ble High Court.in W.P No.5017 of 2018. The selection process will commence after completion of certificate verification of short listed candidates. Further phases of certificate verification may be necessary before commencing process for preparation of selection list. Therefore, the present stage is not declaration of result, however results(or list of selected candidates) will be declared on receipt of final orders of Hon’ble High Court in W.P.No.5017 of 2018. The candidates who were called for Verification of Certificates have to produce the following certificates in original along with a set of Photostat copies duly attested by Gazetted Officer at the time of Verification of Certificates, failing which, they will not be admitted in subsequent process of selection. No request will be entertained for subsequent submission of any of the required certificates. In terms of the Notification, the candidate should possess the requisite qualifications as on the date of the Notification. The Commission reserves right to disqualify any candidate, if she is not found eligible for any reason at any stage. Admission to Certificates Verification does not confer ipso facto any right for Final selection. Note: The Pickup of candidates who approached Hon’ble High Court and obtained interim orders to allow them for further process is purely provisional and subject to outcome of respective and otherW.Ps/W.A.s. Pending before the Hon’ble High Court. Certificate verification will be held at the 10 erstwhile District Headquarters The subject Wise, date wise schedule of certificates verification will be intimated shortly. For convenience of the candidates the certificate verification will be conducted at their native districts. Please visit the Commission’s website www.tspsc.gov.in for the further details.